In central park a man flees from unseen assailants who are revealed as killer dressed like circus folk. 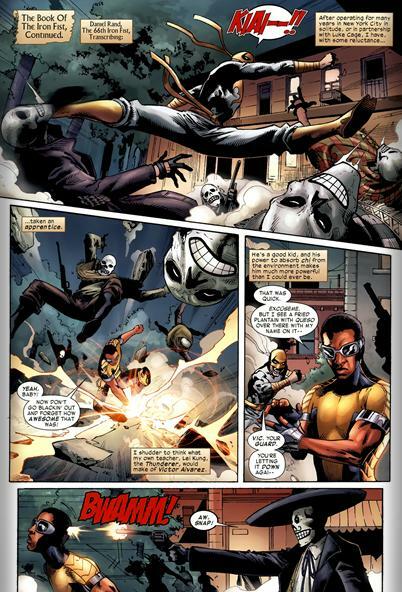 Elsewhere in Brooklyn carnival is underway and a bunch of masked Mexicans try to kill a man but get stopped by Danny and Vic. Afterwards they return to the rand foundation to check in and find out Jennie Royce has been jailed for killing her boyfriend. They visit her and plan to check into her framing though Danny and Vic have differing views on how they should go about this. Danny returns to his apartment and shags his new secretary while Vic checks the crime scene. There he runs into Noir who takes him down. When he recovers he’s confronted by the circus killers from the start of the story. Victor and Danny have chemistry coming out the pores! Here is a man with supreme discipline with an apprentice with not even an ounce. There power difference is also note worthy; Danny earned his power by honing his skills, Vic has natural power able to absorb chi from his environment. Vic is a hothead, Danny is calm. The panels where they share space are some of the best in the issue. All that Power Vic displayed throughout Shadowland Power man in particular Issue #4 is displayed here. Danny even laments this boy has more raw power than him and could easily eclipse him one day. 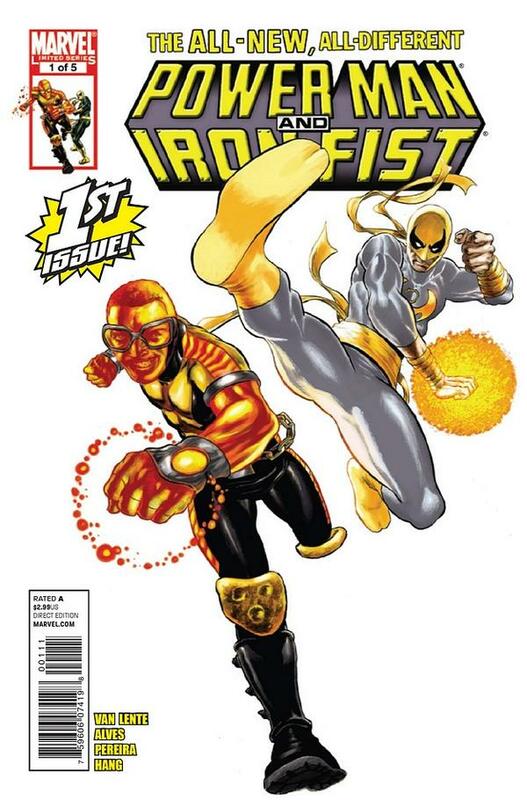 The story itself is a nice nod to old school continuity particularly the old Power man and Iron fist series. They get drawn into a crime which implicates old secretary Jennifer Royce. This old school tie plays into the death which she’s framed for her abusive boyfriend crime buster. Small fact: the original crime buster was killed ad his equipment stolen by this A-hole Eugene Mason an already convicted arsonist and murderer who became a hero for hire inspired by Luke and Danny. Don’t know why but I thought it hilarious that they used the ‘Govonator’ Arnold Schwarzenegger’s likeness for Crime Buster. Vic also brings up a great deal of race history explaining why he wont be calling Danny “Master” at any point. Good stuff! Hated the plain cover- all that space gives it a definitive unfinished/lazy feel not to mention by using Danny’s white costume a different background would have enhanced the aesthetic considerably. The villains “Commedia Dell’Morte” are new but already D-listers who will be forgotten just as soon as this series wraps up. ← X-men: Destiny Images and Trailer! New Powerman to Debut in Shadowland!! !